Falvey Memorial Library :: What is your goal? How can we help? What is your goal? How can we help? Visit the welcoming window display on Falvey’s first floor, created by Joanne Quinn, a member of the Outreach and Programming team. The football theme “What is your goal? How can we help?” vividly connects life on the playing field with using your library to make those academic touchdowns. Maintain your march down the field and go for a first down: Contact the reference librarians and subject specialists who are identified by name and their areas of expertise, as well as other library staff whom you might encounter. 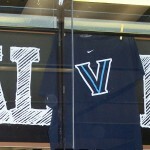 In the center section of the large window, the white goal post frames the large “FALVEY,” its “V” created by that on a t-shirt. The exhibit’s title is also framed by this goal post. Scattered throughout the exhibit are cards relating to football: practice schedules, time out, M.V.P., “We are the champions,” and others. Across the bottom of the window are football-shaped balloons and miniature goal posts. The large goal post is flanked by football lanterns and Villanova football photographs. Joanne’s display unites the academic and athletic aspects of University life in a lighthearted way.